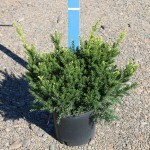 A very dense, spreading shrub with dark green needles. Considered one of the hardiest forms. Ideal for foundation plantings and shrub borders especially when shielded from afternoon sun. Responds well to shearing.